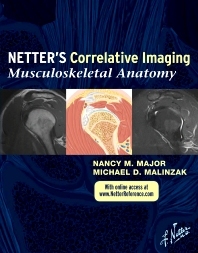 View upper and lower limbs in sagittal, coronal, and axial view MRs of commonly used pulse sequences, each slice complemented by a detailed illustration in the instructional and aesthetic Netter style. Find anatomical landmarks quickly and easily through comprehensive labeling and concise text highlighting key points related to the illustration and image pairings. Correlate patient data to idealized normal anatomy in the approximately 30 cross-sections per joint that illustrate the complexities of musculoskeletal anatomy. Scroll through the correlated images online at www.NetterReference.com.